For the past three days, our polymer clay guild has been hosting a retreat, where about 30 people played in clay from morning until night. We had a fabulous guest artist in attendance, Christi Friesen, who taught us fun and creative techniques. Her upbeat energy and encouragement sparked our enthusiasm and creativity to new levels. The retreat was a wonderful chance to socialize with new people — we had attendees from Texas, Kansas and Illinois, as well as from various Oklahoma locations. It was also an opportunity to know our fellow guild members better, since we weren’t concentrating on a lesson or business meeting 100% of the time we were together. I sat at the table with Stacie and Tom (notBob), and feel like I’ve made two more good friends. The food was plentiful and well-prepared by our team of hard-working guild members, headed by Ruth and Jane. And of course, there were mounds of snacks to graze on at any time. No one starved, that’s for sure! All in all, the retreat was a rousing success, and a good time was had by all. I am refreshed and rejuvenated, and anxious to work on new projects. My first step was to organize my work area with more storage and a larger work surface. When my area gets cluttered with bits of scrap clay, it really inhibits my (sometimes tenuous) creative muse, so having more cubbyholes to stash my clay should help alleviate that issue. I had a fantastic time at the retreat and it was wonderful to have the chance to sit with you and Tom! Hope your creative muse is full steam ahead! 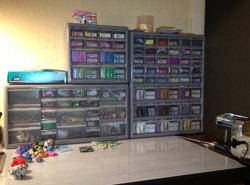 Love your work space… wish I was that organized! Thanks for your kind words! Adding the large storage unit on the right and the smaller one stacked on top of the one on the right should help a lot. In a week or so, it won’t look nearly as organized, though — I have to get busy and make some things for a craft show next Saturday. But I have lots of ideas, thanks to the retreat! Next post: More is Better! Hand-picked favorites for polymer clay artists from my amazon.com store. No upcoming events at this time. Stay tuned for news in the coming months!